Australian touring mogul and Soundwave promoter AJ Maddah has shot down rumors that a reunited classic lineup of GUNS N' ROSES will headline next year's edition of the event. Internet chatter seemed to start on radio station Triple M when outspoken music fan and owner of Cherry Bar in Melbourne, James Young, took to the airwaves to say he had sources confirming to him the GUNS N' ROSES news. Speaking to Music Feeds, Maddah said: "It's been nice for me personally to share this fantasy for a few days along with the fans, but it is not happening for [next year's edition of Soundwave]. "I sure hope those guys do get back together again, as there has never been, or, as far as I am concerned, ever will be such a potent force for rock 'n' roll than the original GNR in full flight." He continued: "If [a reunion of the classic lineup of GUNS N' ROSES] does happen, it is going to take longer than six months for the band to be ready to tour. I think it'll take a hundred lawyers six months just to get the five of them into a rehearsal room together. But if, by a miracle, it does happen, then, of course, I'll throw everything I can to be involved and it would be my last act as a promoter, as after that I'll have nowhere to go!" 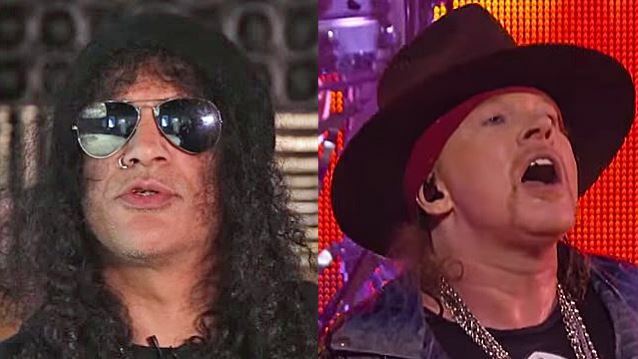 Former GUNS N' ROSES guitarist Slash confirmed on August 21 in a Swedish TV interview that he and GN'R lead singer Axl Rose were on friendly terms again, saying: "It was probably way overdue, you know. But it's…. you know, it's very cool at this point. You know, let some of that, sort of, negative… dispel some of that negative stuff that was going on for so long." On the latest installment of his podcast, "That Metal Show" co-host Eddie Trunk revealed that he was told by Slash's management that the guitarist's recent comments were blown out of proportion by the media and the fans, and that Slash is laying low now when it comes to interviews. Trunk did say that he believes a classic GUNS N' ROSES reunion will eventually happen.